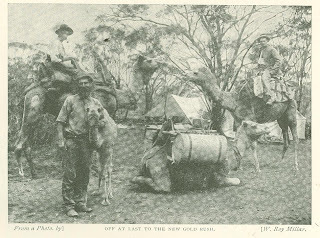 At last, worn out with tramping, and miser­able in the highest degree on account of their continued ill-luck, they were going back to Coolgardie determined to throw up the sponge and look for employment at day wages. The various members of the party had scattered, each one "prospecting on his own" for the time being, but all making north towards Cool­gardie. One of the party, a young Irishman named John Mills, a native of Londonderry, who was not long over from New South Wales, was prospecting alone. One evening, tired with his weary tramp and sick at heart, he lay down to have a smoke and ruminate on his ill-success, wishing himself back on his old employer's station in sunny New South Wales, and out of the country of "sin, sand, and sorrow." The huge reef which he had tested in many places, without seeing a single speck of gold, lay at his feet. Sitting thinking, in a half dreamy, listless state, he almost unconsci­ously rubbed his heel against the huge, moss ­covered outcrop at his foot, and carelessly look­ing down he suddenly caught the glint of some shiny substance on the rock. Lazily raising himself he looked to see what the bright speck was, and found to his intense astonishment and delight that it was a piece of stone full of gold. Breaking several pieces of the cap of the reef, he found to his amazement that it was literally hanging together with gold! Mills's spirits, which but a moment before had been down to zero, now rose to boiling pitch, and he felt inclined to throw up his hat and shout out "Eureka! Eureka!" After having gathered a large number of specimens he walked back to the camp, inwardly exulting though trying to maintain the appearance of dejection. His mates were all gathered together, and were by no means in a pleasant mood. Hard living and hard luck were breaking their tempers, and the conversation was far from cheerful. Some of them had wives and families in other Colonies who were waiting and longing for good news from their bread winners. After supper was over Mills said, "I have something to show you, mates. Wait a minute till I go and get it." So saying he left the camp, and returned in a few minutes with his hands full of stones. "What do you think of them? " he yelled, as he dumped the lot down on the gunny sack which did duty as a tablecloth. As his mates picked them up and looked at them, they found that the pieces of quartz were literally held together with gold. And when they received Mills's assur­ance that there appeared to be an unlimited quantity of the same incredibly rich quartz, the delight of the members of the party knew no bounds. They pressed Mills to lead them to the treasure spot that night, but he pointed out the futility of such a proceeding, as he would be unable to find his way back in the dark. There was but little sleep in the camp that night; and long before daylight the old horse was hitched up and the party were ready to start, moving away with the first peep of day. After some difficulty the exact spot was located, and on reaching the place where Mills had obtained the specimens the night before they found that half the truth had not been told, for, as they broke off pieces of quartz and with hammer, wedge, and pick delved down, the quartz became richer and richer. After the first wild excess of joy at finding such a treasure had passed away the party settled down to hard work, and for weeks toiled like galley slaves, night and day, calcining the stone in an open furnace, and then dollying it by the rudest and most primitive methods - meth­ods which en­tailed the hardest of hard work. At first the novelty of the work and the extraordinary richness of the stone kept them from wearying; but after a while, when the novelty had worn off, the dollying of the stone became a terrible task. John Mills himself assured me that after a time the sight of gold grew positively hateful to him, so monotonous and hard was the toil associated with its extrac­tion. How arduous their labors were may be inferred from the fact that in a few weeks they dollied out about 8,000 oz. of gold, valued at £32,000 - and that with the rudest appliances. So far they had not applied for a lease of the precious ground, and their only fear was that any day a prospect­ing party might drop across them, and probably peg out the place they were working. On the other hand, if they did apply for a lease of the ground, some of the men whose business it was to watch ap­plications when they were posted up outside the Warden's Court (as was required by law), and to find out where fresh discoveries were made, might make inquiries and find where they were--which was the last thing they desired. 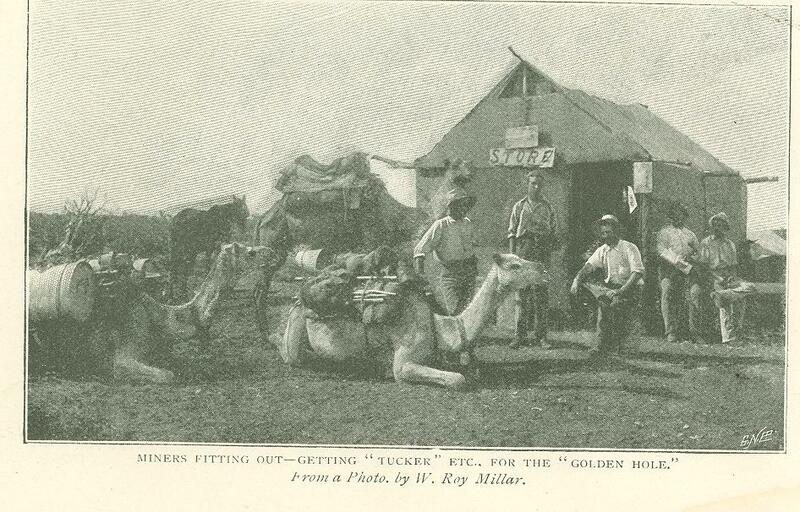 At last their fears of discovery prevailed, and after a solemn council had been held it was determined that Mills and Huxley should go into Coolgardie and get Mr. W. H. Lindsay, a mining agent there, to apply for a lease of twenty-four acres. No hint whatever was to be given of the richness of the property, and the two selected for this duty were well tutored in the tale of woe and distress which they were to pitch to the mining agent, with all the artless eloquence they could command. Accordingly, Mills and Huxley marched into Lindsay's office one forenoon and told him a pitiful tale of the wants and privations they had gone through, and how they had come on a likely place, where the reef was narrow and the stone might yield half an ounce to the ton ­probably a little more. The main reasons why they were willing to stay and give the place a trial were, firstly, that the horse they had was nearly knocked out; the feed was fairly plentiful, and water not far away. Also they were tired of knocking about the country. They had therefore agreed to take up a gold mining lease of twenty-four acres, but being extremely poor men, and having spent nearly every shilling they had in prospecting, they hoped the agent would make the fees as light as possible. But there was a curious air of intense eager­ness about the men - an evident overpowering desire to take up the ground, and a tremendous anxiety that no informality should be made in the application. There was also such a parade of their poverty - a matter about which the genuine miner, be he never so poor, is extremely reticent - that the agent thought there must be something behind it all. So he mentally resolved, whilst applying for the lease now known as the "Londonderry" - to make a search and see whether this party of hard-up miners could really be found - if for nothing else than to congratulate them upon having determined to battle further with fortune in spite of their poverty. A few days after this, Lindsay set out to find the "Londonderry." He searched all day, but was unable to locate the place, and that night had to sleep out without blankets. As the night was intensely cold, he cursed his curiosity for leading him out on such an errand. Next morning, however, he was lucky enough to discover the place. Almost the first thing he noticed was a large open-air furnace for calcining ore; and he had been on too many mining camps not to know what that meant. The party, of whom the whole members were present, were, of course, extremely sorry to see him, and could not help showing how vexed they were. In answer to his inquiries, they told him they had struck a small leader which re­turned them a little gold; and then they tried to bluff him. But Lindsay was far too shrewd and observant to be easily bluffed; and after he had got about 5 per cent of the truth out of them, they pledged him to secrecy. Then, bit by bit, the whole truth leaped out, and the agent discovered what a magnificent property they had, and that there were eight thousand ounces gold in the strong-room! But such an extraordinary find could not long be kept quiet. One of the party, an old man, and rather infirm, took sick, and went into Coolgardie, where, as a relief from the strain to which his mind had been so long subjected, and to give vent to his overpowering sense of joy, he got wildly drunk, flashed his gold about the town, and made a clean breast of it all. When the news was confirmed, the excitement in town became perfectly frantic, and the whole population rushed to see the great "Londonderry Golden Hole." A little later the country along the supposed line of reef was pegged out for miles. 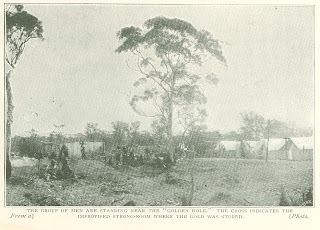 The following day we went out and searched round the "Golden Hole" to find if possible even a color, but were unable to see the slightest trace of gold. It was hard, indeed, to realize that such a wonderful amount of gold had been obtained from the small hole shown to us, with such an apparent lack of favorable indica­tions. Ere the day closed, however, we were fortunate enough to make the acquaintance of John Mills himself, who was far and away the best and most generous of the party. He showed us some magnificent specimens, the like of which had not been seen since the early days when Bayley discovered the great Reward Mine. I shall never forget the excitement which thrilled the whole community, nor the feelings of renewed hope which were experienced by all when it was authoritatively stated that gold valued at between £30,000 and £40,000 had been lodged in the bank for safe keeping, The following day (Monday) some magnificent specimens were exhibited at the bank which fairly astonished the diggers. The desire to purchase this phenomenally rich property became an object of' supreme importance to the representatives of speculative syndicates already on the field. There was a good deal of competition to secure this rich prize, but negotiations were successfully con­ducted by Lord Fingall, who was resident on the field, and ultimately purchased the property for, I believe, £100,000. It was subsequently floated in London and Paris for £750,000. When negotiations for the sale were finally arranged, the "Golden Hole" was covered over with a strong plate and then sealed. Thus it lay for many months, unopened, the subject of many a wonderful story in the newspapers throughout the world. The re-opening of the "Golden Hole" took place some considerable time after the company formed to work it had been floated, and every­thing arranged with much pomp and circum­stance. It was thought possible that if the golden treasure which had been so freely taken out from a shallow depth continued to go down, it might even lead to the depreciation of gold values! The eyes of the whole world were on John Mills's "Golden Hole," and mining men were quite prepared to see gold sent away from it by the ton. But after a few days work in the Londonderry - then considered to be one of the greatest treasure stores in the world - it was found, to the utter amazement and dismay of all concerned, that the kernel had been taken and only the worthless shell left. People looked at each other in blank astonishment when the news was made public. It was darkly hinted by those in authority at home that the "Golden Hole" had been tapped and its treasures spirited away. Surely, they said, it could not be possible that the wonderfully rich mine, which had turned out so many thousand ounces of gold from a small hole­ which had caused the mining world to ring with its fame and to look forward with eager hope to the payment of enormous dividends, could have "petered out! " Alas! it was only too true. The "Golden Wonder of the World" was a wonder no longer; its matchless riches had been exhausted, and one of the biggest mining com­panies had been floated on what was little better than a burst bubble. When the exact posi­tion of affairs became known, and the full truth realized, such a storm of indignation, vilifica­tion, and abuse was let loose upon the heads of the vendors, promoters, min­ing experts, and everyone connected with the flotation as has rarely been equaled. The effect of this blow upon the entire district was disastrous in the extreme. Hundreds of claims that had been taken up and worked on the strength of the great Londonderry find were abandoned, and that after hundreds - in some instances thousands - of pounds had been spent upon them. Public confidence in the per­manence of the goldfields was rudely checked, at least for a time; "Golden Holes" were looked upon askance, and the mining industry severely crippled. The failure of the Londonderry to come up to the high expectations raised had an immense effect upon the Coolgardie gold­fields. It is safe to say that every ounce of gold afterwards taken out of the Londonderry district cost £20. The original holders got out of the Colony with their gains, enriched as they had been "beyond the dreams of avarice "-­ ordinary avarice, that is. Although a considerable time has elapsed and the high hopes respecting the Londonderry have not, to any considerable extent, been realized, yet it is confidently predicted by those who ought to know that there may yet be a big future before it as a dividend payer, and that the disappointments which have been experi­enced in the past may be, to some extent, counterbalanced by the success to be achieved in the future.